The Sam Houston Maduro cigar has a rum flavored filler surrounded by an unflavored maduro wrapper - the best of both worlds. A good time to have one is when you can't decide if you want a sweet cigar or not. I called it sweet & sour, but sweet & savory would be more apt. This is another of Finck's "value cigars," and has a homogenized binder, which, happily, gets lost between the filler and wrapper. The maduro wrapper is one of the best I've tasted on an inexpensive cigar. Sam Houston's can also be had with a Connecticut shade wrapper or an Indonesian wrapper. The filler is "a very mild blend of Connecticut, Honduran and Brazilian" tobaccos. 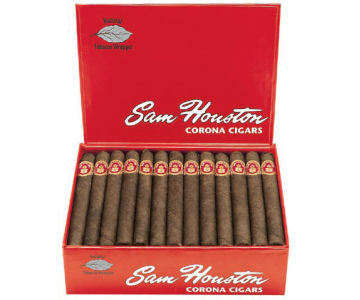 Sam Houston's aren't my idea of an all-day smoke, but they're a great evening cigar. From the factory, they sell for a little over a dollar a piece. This is the last of my reviews of Finck's cheaper brands, I sampled them from the company's Super Value Sampler, which offers up 43 of their economy cigars (8 or 9 each of 5 brands), for 43 dollars. They are nothing fancy, but they all taste good and are well made to boot.